The KEEPGUARD WIRELESS CAM is the latest generation of the KEEPGUARD CAM. 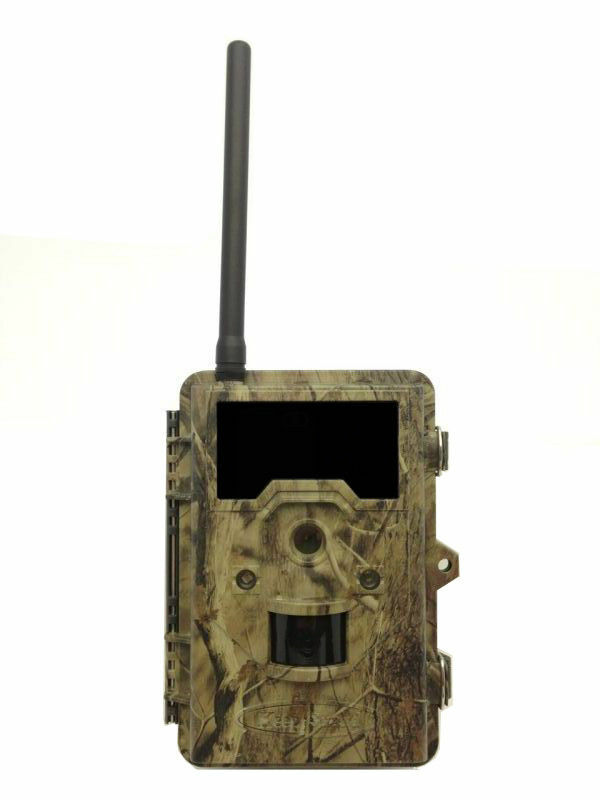 It contains a GSM cellular module which can transmit pictures directly from camera to your cellular phone or email box. It supports MMS/SMTP/E-mail via GSM network. It supports four network bands: 850MHz, 900MHz, 1800MHz, and 1900MHz. Video can not be sent via cellular network. After opening the two latches on the right side of the camera, you will see that it has 12 battery slots. For maximum battery life, we recommend using 12 lithium AA or alkaline AA batteries. Optionally, you can connect an external 9V DC power source to the "DC In" jack at the bottom of camera. It is recommended to use a power source with a current output greater than 1000mA. Please make sure that the polarity is correct. This camera have 32MB internal memory, which is for camera upgrade. Insert the SD card ( OFF mode ) before beginning to operate the camera. SD card is supported up to maximum 32GB capacity. Formatting the SD card removes all files on the memory card and prepares for camera. Press the MENU, then RIGHT or LEFT key several more times to move to the “Format” parameter setting menu. Press OK key to enter sub-menu, Press the UP or DOWN key to highlight YES and press OK. Camera will send pictures to GSM provider, the SIM card in the camera must be from a GSM provider. Make sure your camera mode selector switch is in the OFF position. Insert the SIM card into the card slot with its metal contacts upwards (see right) until it bottoms out and then release. It will snap in place. To remove the SIM card, press on the card until it clicks and then release it. The OFF mode is the "safe" mode when any actions must be taken, e.g. replacing the SD card or batteries, or transporting the device. You will use OFF mode if you connect the camera to a computer′s USB port to download your photos/videos. Once in ON mode no manual controls are needed or possible (the control keys have no effect). The KEEPGUARD WIRELESS CAM will take photos or videos automatically (according to its current parameter settings) when it is triggered by the PIR sensor′s detection of activity in the area it covers. In the SETUP mode you can check and change the settings of the KEEPGUARD WIRELESS CAM with the help of built-in LCD. Moving the power switch to the SETUP position will turn on the LCD display and you will see an information screen. 1.First switch to the SETUP Mode. 3.Press RIGHT or LEFT key scrolls to the next or previous parameter. 4.Press UP or DOWN key to select setting for the currently parameter. 5.Press OK to save the new setting. 6.Then switch to ON Mode to take photos or videos. The camera provides two solutions, i.e. MMS or SMTP, to send the pictures to cell phone and email box. If MMS is selected, pictures will be sent to the preset phone (maximum 5 numbers allowed) or email (maximum 5 addresses allowed) or both phone number and email address. If the Country or Provider’s information is not included in the “Auto Setting”, you must select “Manual Setting” and set the parameters for the URL, APN, IP and Port according to the settings the service provider makes available, please contact network service provider if you are not familiar with these settings. Enter up to 5 different phone numbers in the Phone NO field. You will need to start every phone number with no spaces or dashes. Enter up to 5 different e-mail addresses in the Email field. If SMTP is selected, pictures will be sent from one preset sending email address to one or multiple email addresses via GPRS/HSPA network using the SIM card data plan. a)Country:Choose your Country or Origin in the drop down menu. b)Provider Select:Choose your provider in the drop down menu. 2.Web Mail: Choose a Web Mail you used as a sending email, it will auto-fill the APN,Server,and Port in the Manual Setting. 3.Manual Setting: If the Country, Provider or/and WebMail’s information are not included in the “Auto Setting”, you must select Manual Setting and set the parameters. 4.Email Address: Choose this option if you only want the photos sent to chosen e-mail addresses.Enter up to 5 different e-mail addresses in the Email field. After you finish the MMS or SMTP Setting, you can make a “Wireless Testing” for KG870NV. 1)Put the power switch in SETUP position to enter the preview screen, set the camera in Camera Mode. 2)Press the LEFT key to take a picture after the camera has searched the mobile signal. 3)The LCD screen will show a step bar. Once it displays “Wireless test over, Send Success”, you have successfully sent your first photo and your camera is ready to take Photos. 1)Put the power switch in SETUP/ON position to enter the preview screen. 2)Use the Command Phone send a code #140#, the camera will take a picture after the camera has searched the mobile signal.